﻿ Irish Film Institute -WIN A POSTER SIGNED BY PULP! 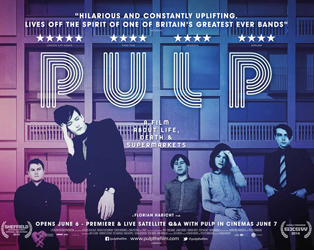 WIN A POSTER SIGNED BY PULP! Celebrating the release of the film Pulp: A Film about Life, Death and Supermarkets, we have a poster signed by the band, and two pairs of tickets to the film, followed by a live satellite interview to give away! First prize – signed poster and a pair of tickets! Second prize – pair of tickets! Formed by Jarvis Cocker in Sheffield in 1978, Pulp spent years in the pop wilderness before finding the success that Cocker craved during the Britpop years with era-defining hits such as Common People and Sorted for Es & Wizz. Discovering that fame wasn’t all it had promised to be, the band gradually retreated from the limelight before entering a hiatus in 2002. They returned to performing live in 2011, and Florian Habicht’s film catches them at their last U.K. gig, at Sheffield’s Motorpoint Arena in 2012. This film opens on June 6th. On Saturday, June 7th, the 17.30 screening will be followed by a live satellite interview with Pulp. Book now. To enter, simply answer the following question! Who is the lead singer of Pulp?